International Experiences: It's All About AIP went to Italy, France and England. EarthyMamacado went to Russia. Business Trips: Field Notes on Healing gives some great advice for navigating business trips and conferences with coworkers. 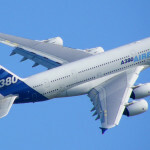 Sleeping Well While Traveling: Gutsy By Nature talks about how to get quality sleep and manage stress while traveling, two things that are very connected to autoimmune flares. It's about more than just the food! Long Flights: Adventures in Partaking shares her experience staying AIP on a 15-hour flight. 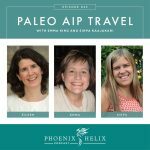 Traveling with Children By Plane: Provincial Paleo travels internationally with her young children, and she covers everything from to food to on-board activities. Traveling with Kids by Car: The Tasty Alternative has some non-food ideas for keeping kids entertained on long road trips. Camping: Kaiku Lifestyle shows us how to camp without compromising our health. Campervans: Autoimmune Wellness shares why this is a great option for people on a healing diet and how to do it successfully. 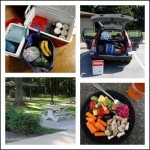 Backpacking: Backcountry Paleo is an entire website devoted to staying AIP while “off the grid”. 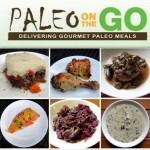 Cruises: Tamar from The Paleo Mom gives advice for staying paleo on a 7-day cruise. Disneyworld: Unbound Wellness shares tips for navigating The Magic Kingdom on the AIP. The Mind-Body Perspective: Last but not least, The Paleo PI tackles travel from the mind-body perspective. 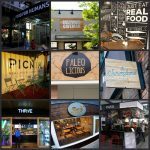 Here's a list of Paleo Restaurants worldwide. Let's hope this is a growing trend! Grazed and Enthused has written a great tutorial on eating safely at a non-paleo restaurant. Find Me Gluten Free is an iphone app that helps you find gluten-free restaurant options throughout the USA. 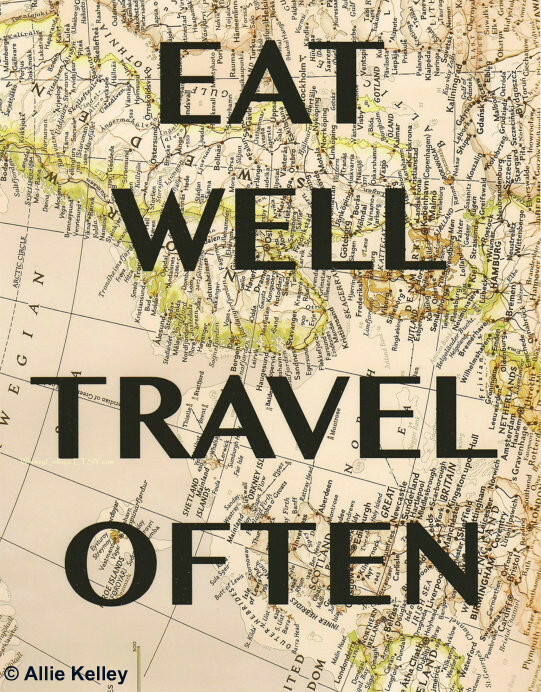 The Eat Well Guide helps you find organic and sustainable food on the road – everything from ethical restaurants to farmers markets. 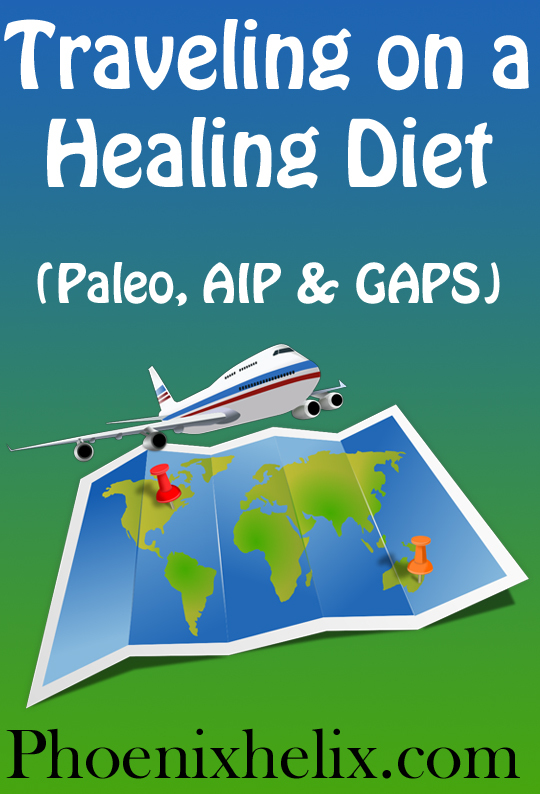 This is a fabulous ebook that tells you everything you need to know about traveling on the paleo autoimmune protocol. The author grew up in Africa, has family in the US, lives in Dubai and regularly travels internationally, so she is an expert. 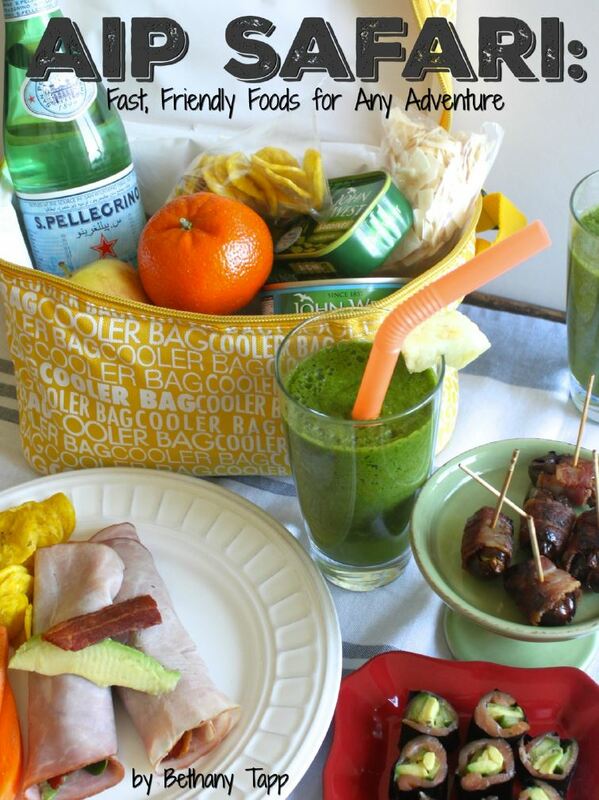 The ebook contains 23 recipes including notes for how long they'll each keep in a cooler. She also shares tips for lodging choices, eating in restaurants, surviving long flights, traveling with children and entertaining yourself “on the road”. And it's just $6. You can buy it here. Art Credit: A huge thank you to Allie Kelley for giving me permission to use her artwork at the top of this post. If you love it as much as I do, she's selling prints through her Etsy shop at a 25% discount. Just enter the code EATWELL.